The ability to maintain postural control is an important factor to be able to perform daily activities. Being able to maintain a stable postural control is automatic for healthy people while there is often a challenging task for children with cerebral palsy (CP) or other with balance problems due to pathology or injury. Keeping balance is a complex and difficult task. Postural control requires interaction between the sensory system, muscular system and the nervous system. Through some of our minds as somatosensory, vision and vestibular system, given the continuous information on where the body and body parts are in relation to gravity and in relation to space. In many situations, the range of motion in the foot can be used to compensate for a disruption of equilibrium. If the ankle mobility is limited, balance problems occur. A key issue at the physical rehabilitation of cerebral palsy is how, for example, the risk for contractures due to immobilization of skeletal muscle can be protected or reduced. Stretching is a common form of treatment used to reduce the rigor and the onset of contractures in the muscles and to some extent increase mobility. Stretching lengthens soft tissue which can result in increased joint mobility. Increased joint mobility, in turn, can increase flexibility. In a study by Taylor et. al demonstrated that greater flexibility improved performance. Despite the widespread use of stretching, there is little research evidence for its effectiveness. Prolonged stretching of the muscles of children with cerebral palsy is believed to reduce the risk of deformities. Contractures and increased muscle tone is seen today as one of the causes of balance problems in children with CP. Is there a relationship between stretching and balance sheet capacity, joint mobility and activity. The postural control is fundamental to the ability of stable body position. Postural stability refers to the ability to balance and body control to keep the body in equilibrium, i.e. to maintain the body's centre of gravity within the support surface. This is done by adapting the muscle force. The body must be kept in equilibrium, both in stationary and in motion. Several sensory information cooperates including the vestibular system, the somatosensory system and the visual system. With CP the balance control may be inadequate or ineffective when the compensatory muscular reactions balance disturbed by a lack of supraspinal control and increased glare sensitivity. A typical compensatory balance reaction patterns means that the muscles that counteract gravity projected outside support surface, ie the equilibrium is disturbed, activated first and straighten up the body. At CP, the pattern may be the opposite, the muscle that further contributes to the shift of the focus is activated in the first place and the equilibrium is disturbed further. One reason for this may be that cortical differentiation of motor control is not optimally developed, which in turn affect the somatosensory feedback and hence the organisation of balance reactions. Children with mild to moderate CP has retained directional specificity but lacking in varying degrees the ability to adjust the balance response to ambient varying requirements. Directional specificity means that when the body is about to fall forward, activate the muscles on the back of the body to prevent the case and straighten up the body. The same occurs in the opposite direction, when the body is falling backwards, activates muscles on the front of the body to prevent the body case and straighten up the body. Children with CP often activates antagonistic muscles when the equilibrium is disturbed, compared with normal motor developing children. In many of the neuromuscular disorders contractures are developed due to muscular imbalance and inactivity. Contracture restricts movement, impairs the conditions for force development, and can cause pain. Contracture is abnormal position of a point as a result of an adaptive shortening of soft tissue or bone changes. Contracture has proven to be difficult to prevent, but they can be delayed in their development and become less pronounced in individuals with CP with treatment such as stretching and flexibility training. Stretching aims to make a muscle longer. Stretching is an elongation of the connective tissue, muscles and other tissues around a joint. Preventive measures that prolonged stretching of muscles and functional exercise reduces the risk of deformities in children with cerebral palsy when the muscles in passive tension slackens muscle fibres and muscle fibres provide more movement space. There are no studies that have shown that passive stretching can increase joint mobility. However, there is evidence to support that passive stretching increases the overall agility of the children with CP. Pin et. al meant that manual stretching can´t be performed long enough to change the length of a muscle and reduce the development of contractures. Manual stretching involves passive stretching that occurs without the patient's own muscular involvement, i.e. using a finisher and finisher body weight force. Studies have shown that 30-minute daily stretching of a spastic muscle retained its length, but that it took 6 hour stretching to increase of a muscle length. Many children with CP treated with periods of stretching felt agile and had a greater ability to perform an activity afterwards. Evidence for the stretching method that is most effective is not yet coated. Measures with stretching based on the recommendations of the Daily movement in joints and muscles in healthy individuals. Regular functional training is important for motor development. However, there are no studies on how often children should practice a skill to learn a function. This is due to several factors such as the degree of disability, the task to be learned, the environment in which the function is to be practiced, the learning ability of the child and the method used. 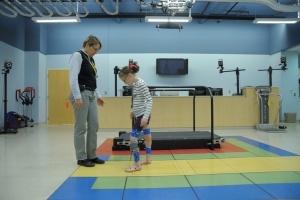 One study showed that children with cerebral palsy benefited from functionally targeted training in their gross motor development and its independence in daily activities. Insufficient movement has several consequences, including the carrying out of technical and coordination demanding activities of daily life is hampered by poor mobility. Balance problems can easily be interpreted as coordination conditional, but it may be due to reduced mobility rash in one or more directions. Reduced mobility of a muscle group or in a joint can lead to increased stress on the adjacent muscle and joint structures, which in turn can reduce the function or increase risk of injury. Therefore, stretching can be an important form of treatment. Impaired joint mobility is often seen in children with CP, which can provide secondary contractures and balance problems.